The climatic battle that brought the Irish phase of an international war to an end. The consequences and outcomes of the conflict still echo down the centuries till today. James' close ties to King Louis XIV of France served to fuel the fires of discontent, and when a male heir was born in June 1688 a number of nobles and clergymen, fearing a backlash of Catholic absolutism, invited William of Orange to take the throne. William duly invaded, and after a desultory campaign, James fled the country for refuge in France, it being claimed that his flight constituted a legal abdication but whilst William sought to consolidate his position in England and Scotland, the Earl of Tyrconnell - James' viceroy in Ireland - began to prepare for his master's restoration. Actively supported by King Louis XIV who viewed any military activity in Ireland as a useful diversion to keep his enemies occupied, James' supporters enjoyed early success, but defeats at Newtownbutler, Derry and - above all - at the Boyne destroyed James' confidence, and he fled his kingdoms for a second and final time. William's army pursued the enemy to the gates of Limerick but failed to capture the city before winter set in, giving the Jacobites a much needed respite in which to reorganize and resupply themselves, during which time military supplies and a coterie of advisors led the by the Marquis de St Ruth, arrived from France. 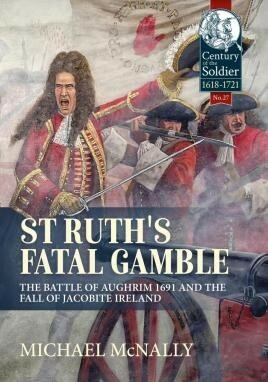 An excellent book for those who alread possess a good understanding of late seventeenth century weapons and tactics and wish to explore the latter part of the Williamite Irish campaign. This is a splendid analysis of the campaign. Using contemporary accounts from both sides, the author has put together a comprehensive hour-by-hour description of the battle, supported by clear maps nd a number of illustrations.